The hype typically generated by FotoFest tends to focus on video installation, interactive computer enhanced works and the latest, greatest digital technique used to fabricate images that can only beg to hold interest. The vast offering of exhibits from the 2002 edition was not different, with the exception of the buzz about a clever installation in the sub-space at Diverseworks. Upon entering the exhibition 20,000 Spools of Thread, the viewer became immediately aware of the tight space in which the work was displayed. The drape of 20,000 multi-colored spools of thread (partially funded by Coats & Clark) instantly rendered a sense of being overwhelmed. With a silent nod to Jan van Eyck, (The Marriage of the Arnolfini) as one turns his or her back to the spools, a discovery of a series of small convex mirrors on the reverse wall is made and the image, Virtual Environment 1, is revealed. 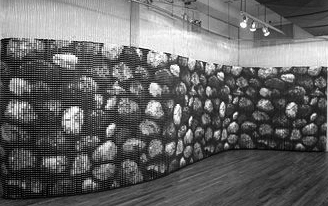 Sperber's image of the three-dimensional stone wall is desplayed at its fullest potential at the Diverseworks sub-space. Here, the viewer is compelled by the image found in the mirror to move close in to and away from the actual work, physically demonstrating the mechanism of "focus." Unlike the typical museum and gallery setting in which the viewer is first offered a distant glance of the spool-strung curtain, in the sub-space, one is forced to immediately confront the exploded macro-image in their face. Devorah Sperber has leapt bounds above the heads of artists who utilize technical savvy in their work. By means of simplifying the very monitors and pixels that are essential to the video, compter and digital artist, she has super-magnified the video or computer monitor. Through the complex weaving of carefully color-matched thread spools, the artis has ingeniously created a unique form of trompe l'oeil on a grand scale.